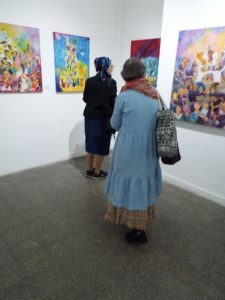 Shortly before Hanukkah in 2017 I had a Solo Exhibition at the Artists’ House in Be’er Sheva. The title of the Exhibition was ‘Joy and Gladness’. Through my art I try to bring some of this into the world. Virtually all my work from 2009 – 2017 was exhibited in one room. The Gallery was very bright with lots of strong color. 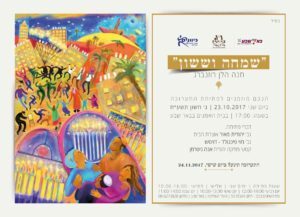 Invitation to ‘Gladness and Joy’. People commented on how they felt O. K. before they came to see my work – but left feeling ‘uplifted, invigorated, happy ……..’ and other such words. Most of the large oil paintings were taken down from my apartment walls, some being 100 x 100 cm, which left my place looking very bare. Most of my friends had seen these paintings, but not many had seen my lino cuts, miniatures and paper cuts. In fact, I hadn’t seen them for some time, as they had been tucked away. I took them to the framers and brought them into the daylight for others to see. Below are examples of these. Some people had seen my work only on my website, but were interested to see it ‘in the flesh’ as it were. They told me that they enjoyed seeing the sizes, the brush marks, etc. 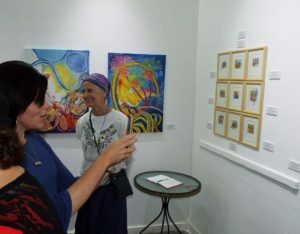 The Opening Night was very successful, with about seventy people attending. We were running out of chairs for people to sit to listen to the Jewish music and the speeches. People talked to me about my work and said very positive things. A lot of visitors wrote their comments in the Visitor’s Book. 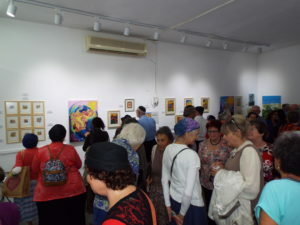 People continued to visit the Exhibition after the Opening Night. Some of those people were unable to go to the Opening Night, but some of them went back for a second look. Some had heard about it from others, and some had read posts about it. 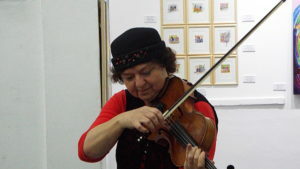 Find out more about the Artists’ House, Be’er Sheva, on Facebook. So that you may see what I am working on now, you might like to Join me on my Facebook page. Most of all, I have been happy with the positive feedback from visitors. 20.11.2017 This morning I had my ‘Ivrit Talk’ conversation on the phone. I talked about my Exhibition. My teacher said that she had a conversation with someone who lived in Be’er Sheva. The subject the student chose was her visit to the Artists’ House to see my Exhibition, which she enjoyed very much. I have no idea who this was. I have just now got notification on my phone of a new email. It reads like this – ‘I was at the Exhibition today – and here’s the proof! (He sent a selfie). Terrific! I wrote in the visitors’ book what I thought about it! I enjoyed it very much indeed. Well done!’ Now isn’t that a nice email to get? Fortunately, I have had other positive emails. To conclude – I have begun working towards my next Exhibition. After working hard to finish the last illustration out of 17 for a poetry book, (which is due to be published at the end of this year), I am thrilled to be starting a large canvas (120 x 80 cm) on the Festival of Succot. Oh, and last week I designed a CD cover for a Jewish singer. I am kept pretty busy.